It's this time of the year again! Please help me do well. It's easy, you can vote via Twitter. 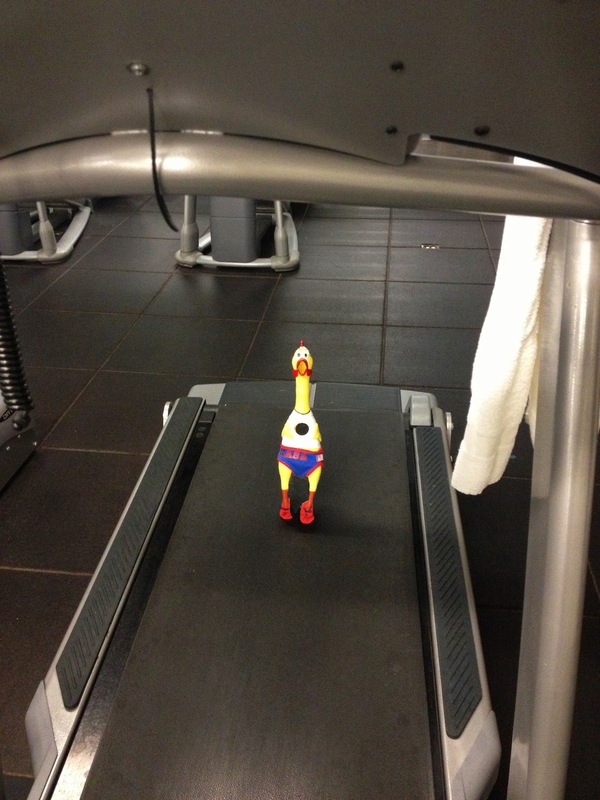 Staying fit and healthy benefits us all. In my case it is a necessity. Not only because I will be running the Solar Eclipse Marathon in Port Douglas, Australia on November 14, 2012, but I also have to stay strong for my upcoming space flight mission. 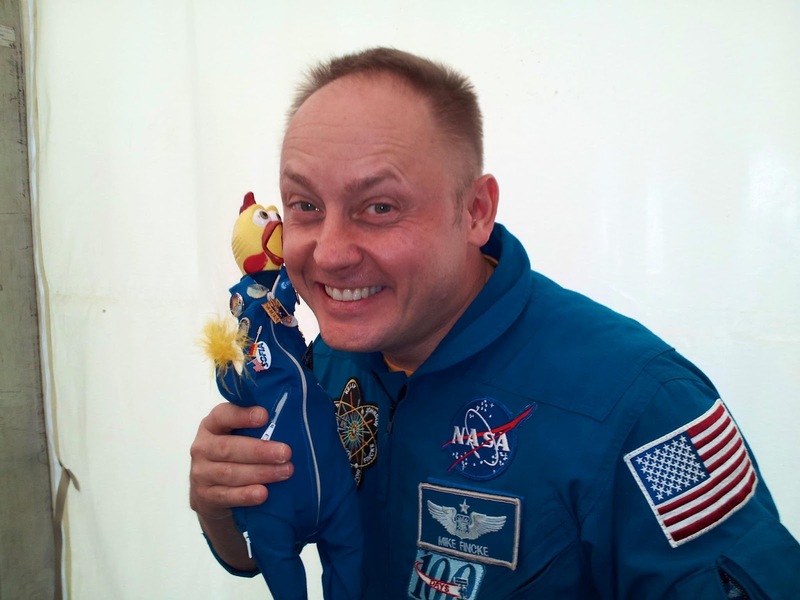 ESA's Astronaut and Exp 40/41 crew member Alex Gerst cheering me on! In partnership with the White House "Let's Move!" initiative, NASA's "Train Like an Astronaut" program aims to increase opportunities in both in and out of school for kids to become more physically and mentally active. This program uses the "Have you ever wondered what it takes to be an astronaut?" excitement of space exploration and astronaut training to challenge, inspire, and educate kids to set physical fitness goals and to practice physical fitness and proper nutrition. In this program kids will explore mission challenges, learn the science behind nutrition, and learn to train like a real astronaut! It's a ton of fun. These activities were developed in cooperation with NASA scientists and fitness professionals who work directly with astronauts like me and my Expedition 40/41 crew members Reid Wiseman (NASA) and Alexander Gerst (ESA). Although the program is designed for 8-12 year olds, it is for anyone and everyone who is curious about exploration and what it takes to be an astronaut. Plus, keeping your body healthy and in shape is a fun bonus! 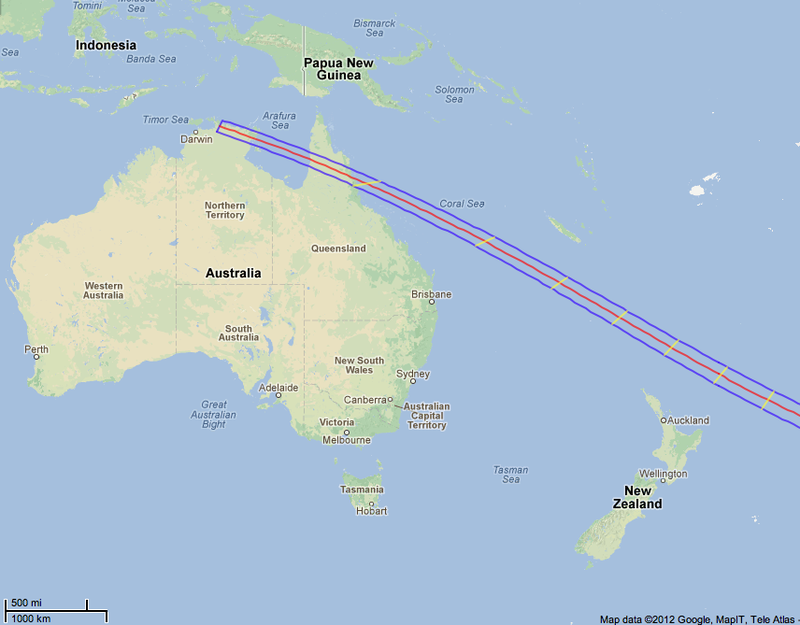 On November 14, 2012 from 5:45 to 7:40 AM (Australia time) the solar eclipse shadow will sweep across Cairns & the Great Barrier Reef region. I will be in Cairns, Australia to observe this amazing event. Below is map showing the path of the eclipse. As you can see the majority of the Moon's shadow will be casted over the Pacific Ocean. And a more up-close view of where in Australia people can observe this event. This particular region has not seen a total solar eclipse since 17AD and the next one won't happen for over 200 years. Needless to say, many spectators are expected to come and safely view the Moon dance in front of the Sun. How exactly does a total eclipse happen? 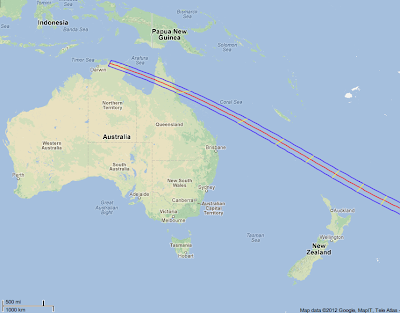 Would you like to know more about the Australia 2012 Solar Eclipse? Severe sunburn on the shoulder of a 30 year old woman. The skin has become reddened, inflamed and blistered due to overexposure to the ultraviolet light in sunlight. 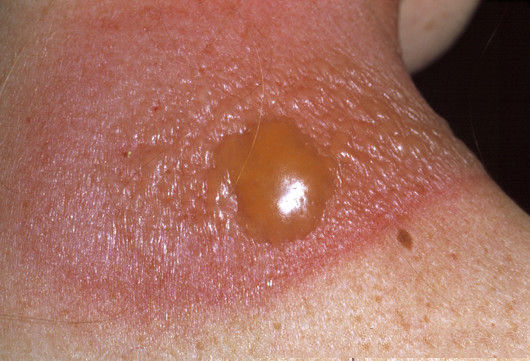 Burns causing blistering are classified as second degree burns. As we officially start summer on June 20, 2012 and we get to experience the longest day (by that I mean daylight hours), it is a good idea to quickly review the issue of sun-overexposure. But first, why does summer start on the longest day of the year? Shouldn't we already be halfway through the summer? Blame the oceans, which heat up and cool down only slowly. By June 20 they are still cool from the winter time, and that delays the peak heat by about a month and a half. Similarly, in December the water still holds warmth from the summer, and the coldest days are still (on the average--not always! ) a month and a half ahead. - In direct contact with the dermis is the basal layer. If you have ever heard of a basal cell carcinoma (cancer), this is where it starts. - Above the basal layer is the spinous layer. - Above the spinous layer is the granular layer. - Above the granular layer is the stratum corneum. The stratum corneum is the outer layer of dead cells -- the cells that we see as our skin. The cells in this layer are filled with a protein called keratin. Keratin is a very interesting protein because it is tough -- horns, hair, hoofs, fingernails and feathers all gain their strength from keratin. The same stuff that your fingernails are made of actually forms your visible skin (but in a much thinner and more flexible layer). That is what makes your skin so tough. In parts of the body that get a lot of wear, like the palms and the feet, the stratum corneum is thicker to handle the abrasion. Living among the basal cells in the malpighian layer is another type of cell called a melanocyte. Melanocytes produce melanin, which is a pigment that is the source of tanning. The melanocytes are actually where a tan comes from. Melanocytes actually produce two different pigments: eumelanin (brown) and phaeomelanin (yellow and red). Red heads happen to produce more phaeomelanin and less eumelanin, which is why they don't tan very well. In albinos, the chemical pathway that produces melanin cannot proceed because an enzyme called Tyrosinaseis missing. Therefore albinos have no melanin in their skin, hair or irises. When you get sunburn, your skin is actually damaged by UV radiation and your body is responding to the damage. The body responds to the damage with increased bloodflow to the capillary bed of the dermis in order to bring in cells to repair the damage. The extra blood in the capillaries causes the redness -- if you press on sunburned skin it will turn white and then return to red as the capillaries refill. 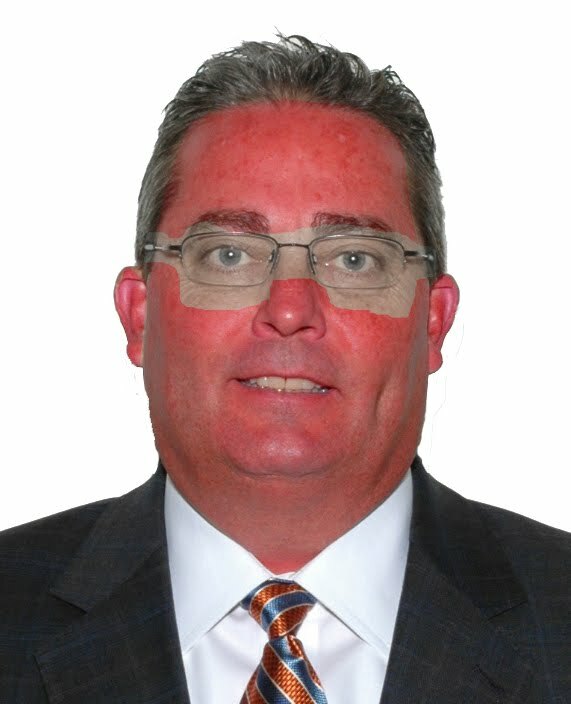 The best way to avoid sunburn is fairly obvious: Stay out of the sun. Specifically, avoid direct sunlight between the hours of 10 a.m. and 4 p.m., when UV light is most intense. If you must be outdoors, find shade. If you're heading to the beach, bring a sun umbrella to cast some shade when you're relaxing in the sand. - Broad-spectrum protection (protects against UVA and UVB rays). - Sun Protection Factor (SPF) 30 or greater. - Generously apply a broad-spectrum, water-resistant sunscreen with a Sun Protection Factor (SPF) of at least 30 to all exposed skin. “Broad-spectrum” provides protection from both ultraviolet A (UVA) and ultraviolet B (UVB) rays. Re-apply approximately every two hours, even on cloudy days, and after swimming or sweating. - Wear protective clothing, such as a long-sleeved shirt, pants, a wide-brimmed hat and sunglasses, where possible. - Use extra caution near water, snow and sand as they reflect the damaging rays of the sun, which can increase your chance of sunburn. - Avoid tanning beds. Ultraviolet light from the sun and tanning beds can cause skin cancer and wrinkling. If you want to look tan, consider using a self-tanning product, but continue to use sunscreen with it. - Check your birthday suit on your birthday. If you notice anything changing, growing, or bleeding on your skin, see a dermatologist. Skin cancer is very treatable when caught early. 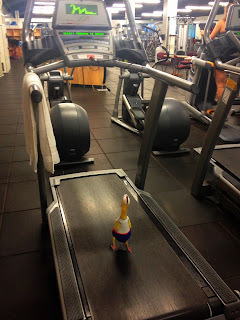 Let's get to the good part right now! 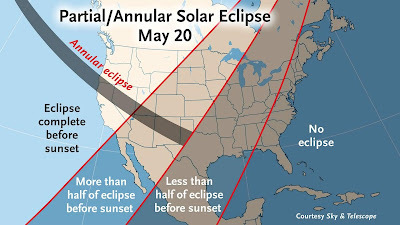 On Sunday afternoon (May 20, 2012) we will be seeing an annular or partial solar eclipse. It depends where you are at the time the Moon moves in front of the Sun. I will be launching late Sunday afternoon on another mission to the Edge of Space. 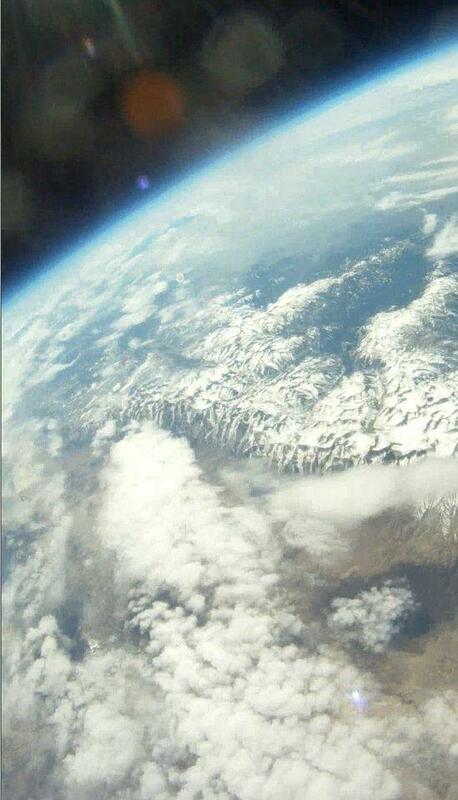 The students from Earth to Calculus will be launching me, along with some cameras, to the Stratosphere. The goal is to not only see the eclipse from 100,000+ feet, but to look down and see Moon's shadow move across the land. This flight will be special. My 4th flight overall and my 1st with International participation. If my new UK Spacesuit arrives on time, I will be wearing it proudly. That's right. The wonderful Sue Drage from Rugby in England made me a suit out of recycles plastic bags. All started when I was on the BBC Vic Minett Afternoon radio show three weeks ago. The wonderful Vic put a call out for somebody to knit me a new suit. And sure enough, only a week later I was on the show again and was told that Sue Drage was making me a suit. But not only that - last Monday (on May 14, 2012) I was asked to be on the Vic Minett Afternoon Show again. I had suggested to make a "Space & Science" segment and I got some wonderful scientists and a real astronaut to call in. And even though it was very short lead-time we pulled it off. 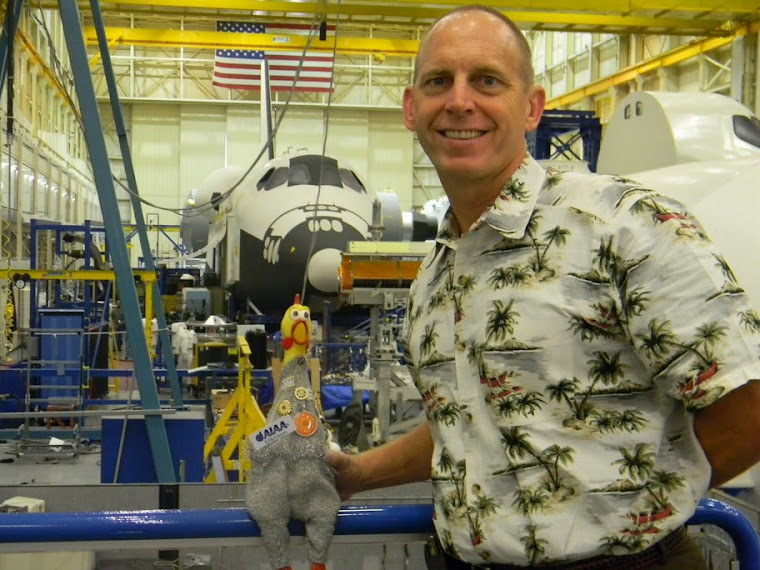 We had the local astronomer Dr. Joe on the show and then NASA Astronaut Mike Fincke called in and he was wonderful. Dr. Lucie Green, a UK solar scientist, also interviewed and throughout the show listeners could submit space poems. Well, the recording of that special show with all the guests on it will go on the Golden iPod (yes, it is golden - just like the records on the Voyager spacecrafts) and I will be playing the show back during my ascent to 40 km altitude. Here is where you come in. I might have some memory left on the Golden iPod. Do you want me to take a picture, maybe a song you have written, or a poem you have created, with me? Then email it to me! Please keep it under 20 MB as the attachment. It must be an original art work of yours. I will take it with me on my flight and then return it to you after it has been to the Edge of Space. Send it to CamillaSDO at gmail dot com (get it?). 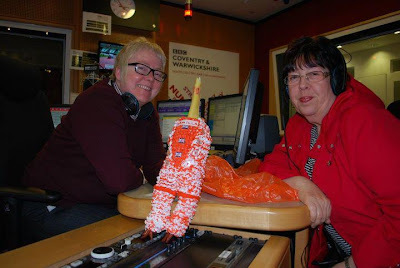 Vic Minett (on the left) with Sue Drage and the new spacesuit for me. Huge thanks! 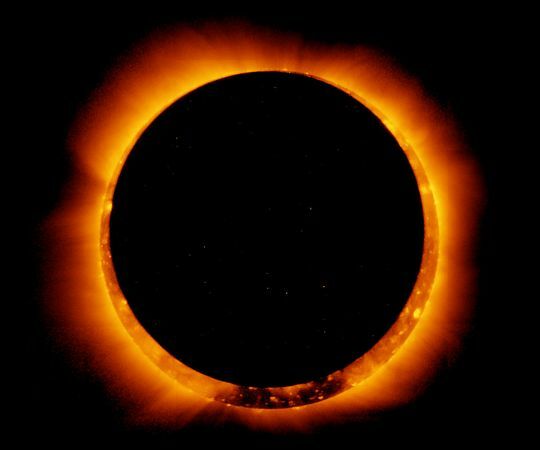 An annular eclipse occurs when the Moon passes directly in front of the Sun, but the lunar disk is not quite wide enough to cover the entire star. At maximum, the Moon covers almost the entire Sun - but parts still visible from the Sun show a "Ring of Fire" around the Moon. (see top picture!). An annular eclipse is different from a total eclipse. 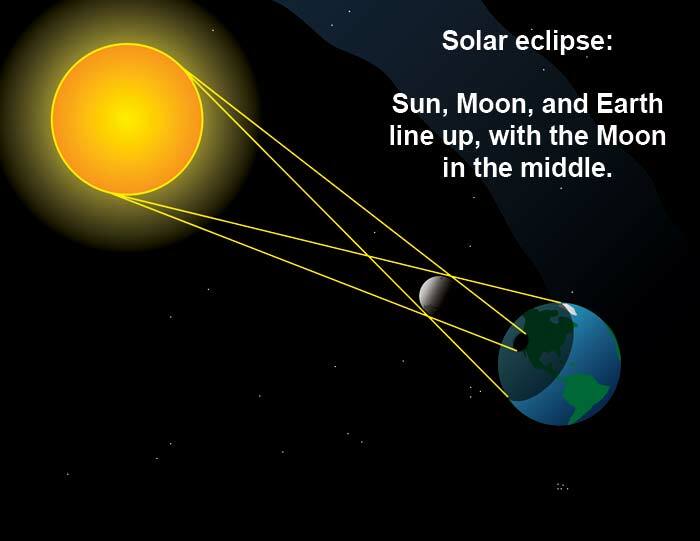 During a total eclipse the Moon covers the entire Sun, reducing daylight dramatically and showing the Sun's corona. But because the Moon's orbit is elliptical, during an annular eclipse our orbiting body is too far away to fully cover the Sun for us down here. Please, please do not look unprotected at this beautiful event. Even though 94% of the Sun will be covered, you can still damage your eyes. A #14 welder's glass is an appropriate choice. There are also many safe solar viewing products out there. Here is a great 3 minute movie from Science@NASA about the annular eclipse. 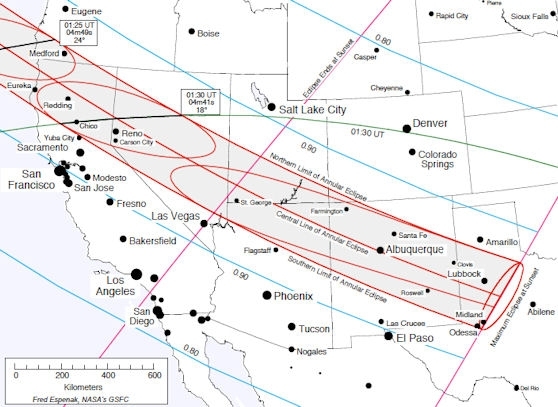 If you are within the dark corridor (Nor Cal, part of NV, UT, AZ, NM and TX) you will actually be seeing the Ring of Fire. For all others it will be a solar eclipse. A closer look at the areas you will be able to observe the "Ring of Fire". I am back from my trip to NASA’s Goddard Space Flight Center, the home of many fantastic missions, including our very own Solar Dynamics Observatory. Every time I visit Goddard, I get to learn about other very interesting science missions. This time I had the pleasure of learning about Landsat. In fact, I got to sit down with Dr. Jim Irons, who is the Landsat Data Continuity Mission Project Scientist and the previous Landsat 7 Deputy Project Scientist. Have you ever wondered where many of the Earth Images that NASA and the United States Geological Survey (USGS) come from? The images not only provide a wide breadth of data for scientists to study but sometimes are picturesque enough to be art. 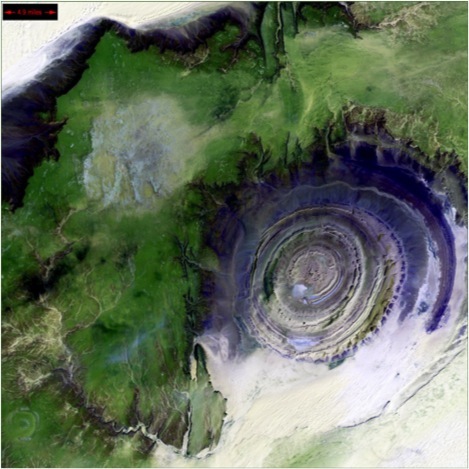 Take the image of the Richat Structure below in Sahara Desert portion of Mauritania. The picture is not only breathtaking but also provides geologists with insight to the creation of the structure and the various soil types found within the structure. Now instead of telling you, I’m going to ask you, what type of structure do you think the Richat Structure is? This image is brought to you by Landsat-7, the seventh satellite in the Landsat Program. The Landsat Program is jointly managed by NASA and the United States Geological Survey (USGS), and over the years has consisted of 7, soon to be 8 Earth-observing satellites with the upcoming launch of LDCM (Landsat-8 it will be renamed once it achieves orbit). This first satellite of this program was launched and started collecting data in 1972 making it one of the longer running programs in the history of NASA, up there with the likes of the Voyager program. So for almost 40 years, this program has been taking images of our Earth and helping us understand the changes that go on here on Earth’s surface. Now, how does this tie in with SDO you ask? Well our Sun plays a very important part, since the Landsat instruments measure the solar radiation reflected by the Earth’s surface! 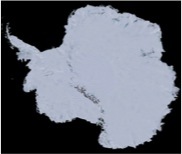 For more information on how the images from Landsat are made feel free to visit this awesome tutorial put forth by the Landsat EPO team. Now during my recent trip to Goddard, I was able to get in touch with Dr. Jim Irons of the Landsat Program and he was nice enough to sit down and answer questions from some of you. Dr. Irons is a soil scientist (PhD 1993) who is currently the Landsat Data Continuity Mission (LDCM) Project Scientist. Before this he served as the Landsat-7 Deputy Project Scientist. He also is the Associate Deputy Director for Atmospheres in the Earth Sciences Division at Goddard and has been a physical scientist at Goddard for 33 years. The following are the questions we posed to Dr. Irons that you submitted to us! Again, thank you to Dr. Irons for taking his time and talking to me; I really learned a lot about the Landsat Program. Hope you all enjoy! For more information, follow @NASA_Landsat on Twitter, look up Landsat on Facebook, or visit their website. Q: What are the differences between an Earth Observing Satellite and a planetary one? Believe it or not, there are actually many similarities when it comes to Earth and planetary satellites; both are built to make remote observations of a planet. The difference is that Earth observing satellites make observations of the planet we live on. As a consequence, Earth observing satellites are more concerned with sustained observations with which we are very familiar. The changes we see here on Earth often are due to human impacts that can happen very rapidly in comparison to the results of geophysical processes we may see on another planet, which may act over much longer time periods. Planetary Observing Satellites collect more exploratory observations of things that have never been seen before. Q: What have we been able to learn from Landsat, and more importantly what do you feel is the most significant observation regarding human impact on Earth? The whole point of the Landsat Program is the scope of human activity. It cannot be narrowed down to one single significant observation but many important examples can be cited: Tropical forest disturbance and recovery is one of them. Before Landsat there were no credible estimates of forest disturbance and recovery within the tropical regions. A program termed Landsat Pathfinder delivered the first rigorous estimates of disturbance rates in the 1990’s and now tropical countries such as Brazil have been able to accurately track and measure that activity on and annual basis using Landsat data . - A significant and unexpected impact the ability to track water consumption in semi-arid regions such as the western U.S. using Landsat data. The area of irrigated land has increased within the US and globally over the past 40 years of Landsat observations. Water managers have found that they can use Landsat measurements to calculate how much water is being used by irrigated fields for crop production. For more on this, visit this great article on how Landsat is used to monitor water use from space! 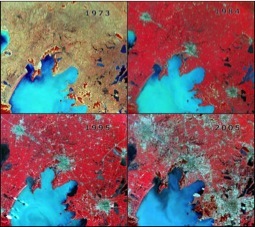 - Landsat also monitors the loss of prime agricultural land due to urban expansion. This isn’t just happening locally. Farms around the world are disappearing as cities grow, and Landsat data is available to monitor that change. Q: How many miles total has the Landsat program traveled/orbited? A lot! It hasn’t been calculated, but it definitely can be done. But the answer would be, a lot! For you math and science people out there, why do you give this a try! Q: What is LDCM? What’s new about it? LDCM stands for Landsat Data Continuity Mission; it is the eighth satellite in the Landsat program, again a collaboration between NASA and the USGS. The satellite and its instruments will provide moderate-resolution measurements of Earth’s surface in visible light (the type of light people can see) and other wavelengths of light that people can't see--near-infrared, short wave infrared, and thermal infrared. LDCM will primarily look at land and the poles. A fun fact for you all, the thermal infrared instrument aboard Landsat, also known as TIRS, was built in the same building here at GSFC as Little SDO! This Landsat Satellite has a design life of 5 years but will carry enough fuel for 10 years of operation. Now one major difference between LDCM and all previous Landsat satellites is that the sensors on LDCM will collect data in a different way. All previous Landsat sensors (with the exception of the rarely used RBV (return beam vidicon) cam) used a moving mirror that moved side-to-side to make measurements across the ground swath, the strip of Earth's surface that Landsat images. For those remote sensing scientists out there, the instruments were multi-spectral electrical optical scanners that employed an oscillating mirror to image across the instrument field of view. On LDCM these sensors (both the operational land imager and the thermal infrared sensor) are push-broom sensors that use a line of detectors that simultaneously make measurements across the swath width. This will offer advancements in radiometric performance and sensitivity. Q: When is LDCM launching and from where? Can the public watch? What are the mission’s primary objectives? One of LDCM’s major mission objective is to, as its name states, is to continue the capability to monitor land use and change in land cover across the globe and extend the 40 year-long record of observing the Earth’s surface. LDCM will be launching out of Vandenberg Air Force Base (VAFB) on an Atlas V rocket. This is because the satellite needs to go into a near polar orbit. Satellites are not launched into polar orbits from Kennedy Space Center/Cape Canaveral launch sites because the launches would require the rockets to begin ascent over populated land areas. The best place for the public to watch launches from Vandenberg, according to their website is off of Corral Road near the VAFB main gate. The launch window for LDCM runs from January 15 to February 15, 2013. Q: Will we (Landsat Program/US) continue our relationship with SPOT until that time and beyond? The USGS is capturing some data from the French SPOT remote sensing satellites into its archives although there is no formal connection between the two satellite programs. The data in some respects are similar and depending on the application can be used together; for example, vegetation indices are derived from both Landsat and SPOT data. However, there is work going on behind the scenes on establishing interactions with the Sentinel-2 program of the European Space Agency (ESA). This program will launch satellites similar to the Landsat satellites beginning in 2013. The current discussion is of cross-calibrations of the Multispectral Imager (MSI) being built for the Sentinel-2 satellites and the Operational Land Imager (OLI) built for the LDCM. More information can be found here. Q: What are the various majors and backgrounds of people working on the Landsat Program? Dr. Irons, himself a soil scientist, put it best when he said, when it comes to the Landsat Program, it’s an open tent! The scientists that are engaged on the program come from a wide array of earth science fields: geographers, geologists, all varieties of botanists, foresters and forest ecologists, plant physiologists, hydrologists, you name it earth science wise. There are even some social scientists, such as anthropologists and cultural geographers. And let’s not forget the others it takes to support a mission such as accountants, managers, consultants, contract specialists, and the list goes on! 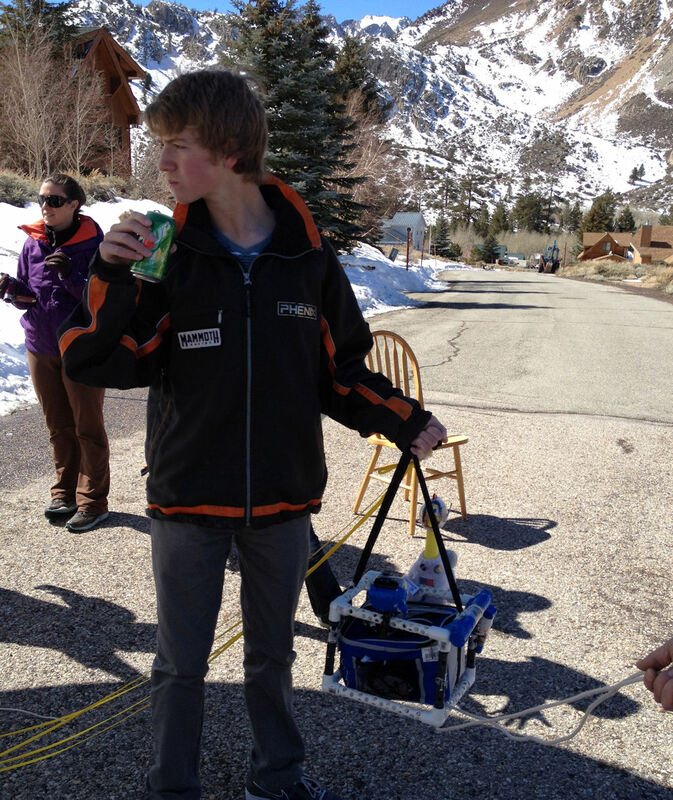 In March 2012, when the Sun unleashed the most intense radiation storm since 2003, peppering satellites with charged particles and igniting strong auroras around both poles, a group of high school students in Bishop, Calif., knew just what to do. They launched me into the solar radiation storm! The students inflated a helium balloon and used it to send me to an altitude of 120,000 feet where I was exposed to high-energy solar protons at point-blank range. "We equipped Camilla SDO with sensors to measure the radiation," says Sam Johnson, 16, of Bishop Union High School's Earth to Sky student group. 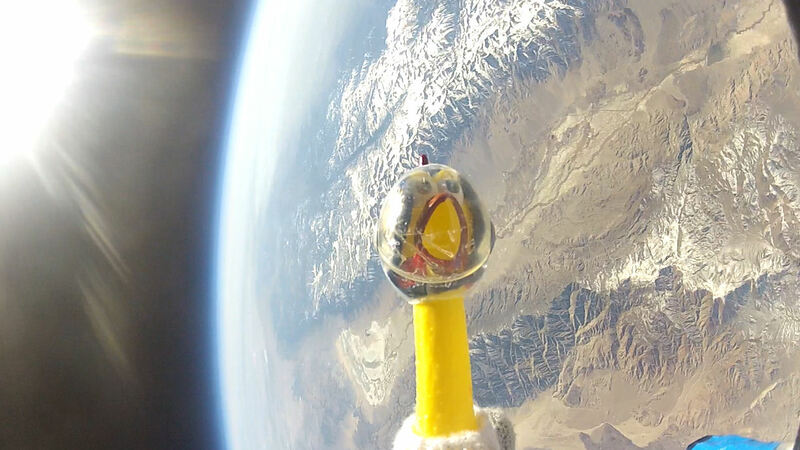 "At the apex of our flight, the payload was above 99 percent of Earth's atmosphere." On the outside of my space suit which was knitted by Cynthia Coer Butcher, I wore a pair of radiation badges, the same kind medical technicians and nuclear workers wear to assess their dosages. I actually flew twice--once on March 3 before the radiation storm and again on March 10 while the storm was in full swing. This would give the students a basis for comparison. On March 3, during the calm before the storm, the Earth to Sky team assisted by a local class of fifth graders attached me to the payload, inflated the balloon, and released the "stack" (balloon, parachute and payload) into a cloudless blue sky just before local noon. 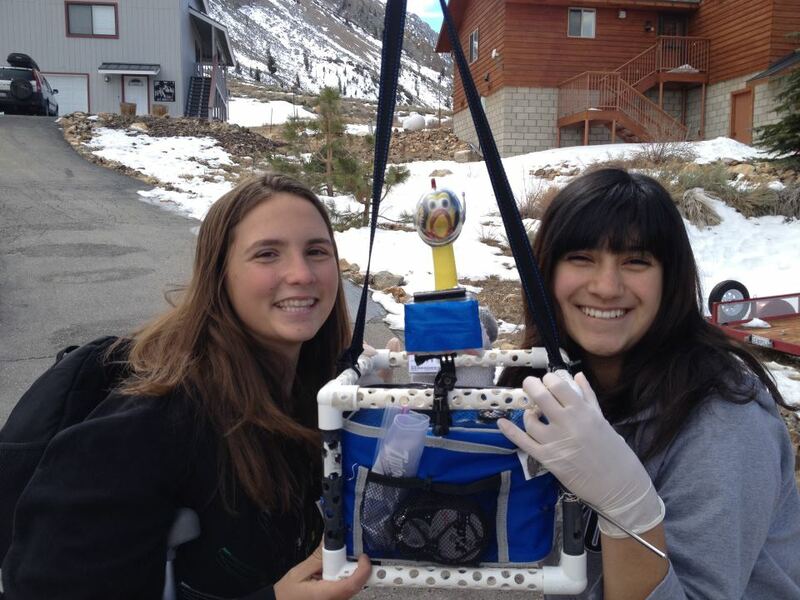 "It was a beautiful lift-off," says Amelia Koske-Phillips, 15, the team's payload manager and "launch boss." 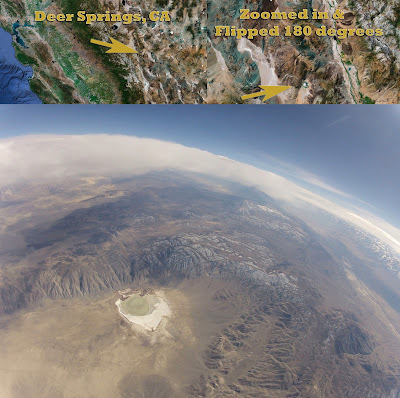 During the two-and-a-half-hour flight, I spent approximately 90 minutes in the stratosphere where temperatures (-40 to -76 F) and air pressures (1 percent sea level) are akin to those on the planet Mars. 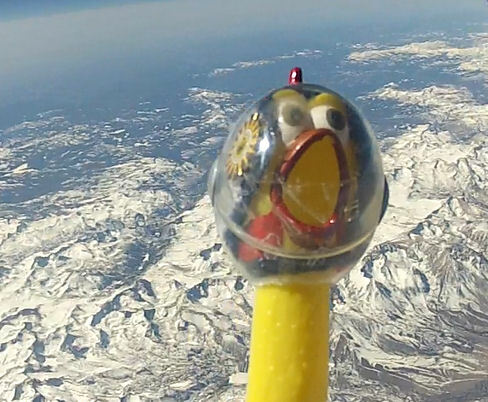 The balloon popped, as planned, at an altitude of about 25 miles and I parachuted safely back to Earth. The entire payload was recovered intact from a landing site in the Inyo Mountains. This time I flew into one of the strongest proton storms in years. The source of the radiation was sunspot AR1429, which unleashed more than 50 solar flares during the first two weeks of March. At the peak of the storm, from March 7 to March 10, charged particles hitting Earth's upper atmosphere deposited enough heat in only three days to power every residence in New York City for two years. At the moment of my launch on March 10, Earth-orbiting satellites reported proton counts approximately 30,000 times normal. Big thank you to the kids of Earth to Sky Calculus.